This is a AR60 Billet Machined Aluminum Axle Housing with Aluminum Link Mounts. Stock dimensions and fits all original AR60 axle internals including gears, drive shafts, knuckles, hubs and lockouts. Can be used for front and rear axle. Internals are not included. 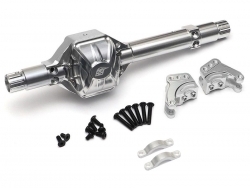 Billet machined for durability and light weight for speed and acceleration.